On Day 2 in Bangkok, I found myself sitting in a modern dining room, surrounded by other Foodies, sampling food at Nahm, the 2014 Best Restaurant in Asia (as proclaimed by S. Pellegrino). I was sweating buckets and sniffling like a madman. The food was so delicious and it literally set my taste buds ablaze. 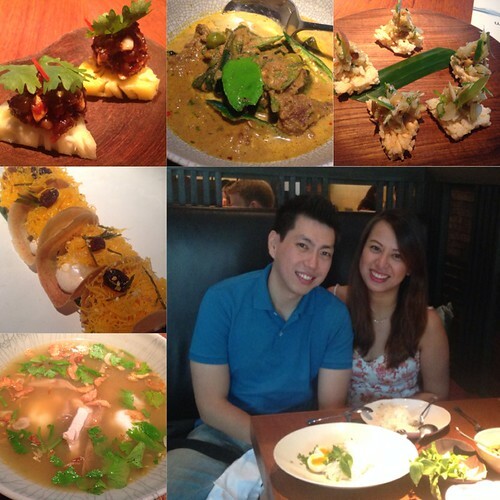 If you would like to try Nahm, reservations are a must as they get super full. Ever since they were proclaimed the Best Restaurant in Asia, it’s been difficult (not impossible) to get a table. I snagged our lunch table 3 weeks in advance. 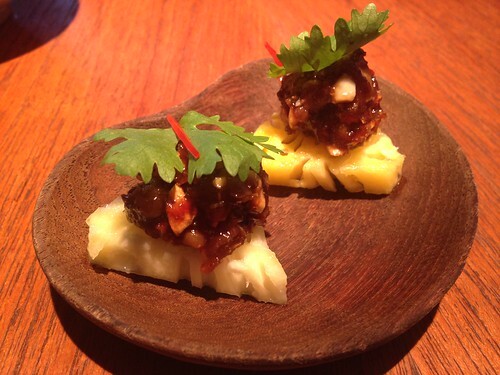 We started with the amuse bouche – a savory sweet bite of pork over pineapple. Derrick hates pineapples but he enjoyed this. We both agreed that one bite wasn’t enough. 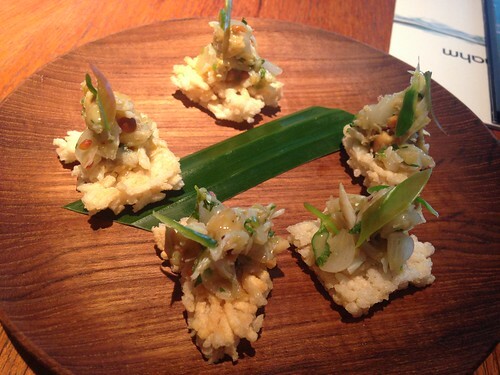 We ordered the blue swimmer crab over rice crackers canape and we both also agreed that this was delicious. Sweet crab meat, tangy, slightly spicy sauce over a fresh crunchy rice cracker. I highly recommend this. According to our server, this is one of their most popular dishes. Derrick ordered the hot and sour soup. I took a huge spoonful of this which I regretted as it set my mouth on fire. The heat is different, it creeps up on you slowly and courses slowly and surely though your entire body. You feel it in your throat first (not your mouth), your nape and ears. It’s not the typical “chili sauce” spicy, it’s more lasting and well, deadly. Don’t get me wrong though, it’s absolutely delicious. 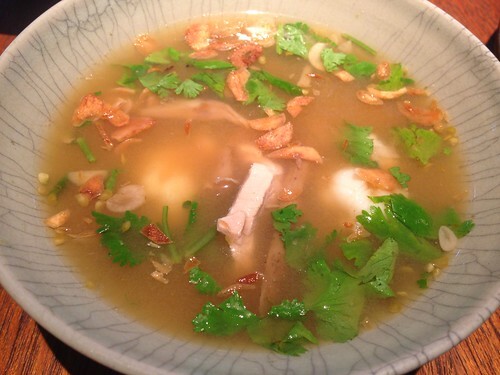 Heat aside, it’s Tom Yum Goong at a whole new level. As suggested by our server, jasmine rice helps with the heat which was true. Unless you are really into spicy food, I would not suggest ordering this. 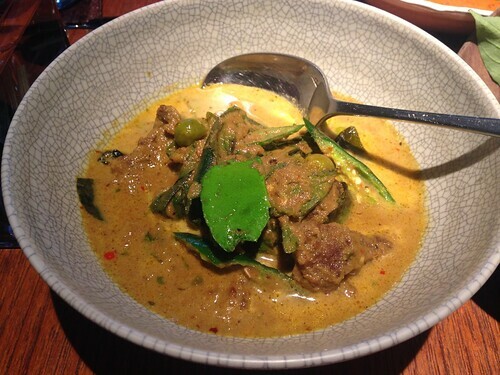 For the mains, we had the green curry with beef. This is also spicy much like the soup but it was a sweetness to it. I highly recommend this. The beef is tender and the sauce is amazing flavorful but also has a stealthy spicy kick in the end. Derrick claims it’s the best green curry he has had. 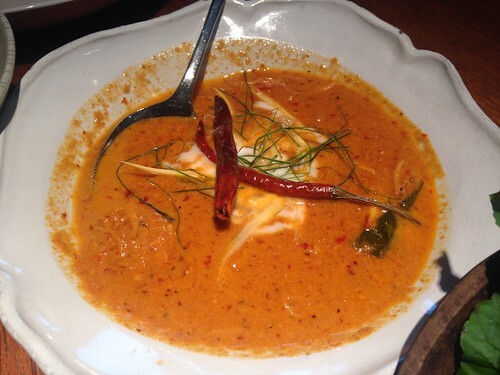 It has ruined all other curries for him because he only wants the one from Nahm. Throughout the meal, he would say quietly to himself “damn this is good curry” over and over again. It’s worth the spiciness. Also one of the most popular dishes on the menu. We also had the noodles with curry chicken. It was a yellow curry. 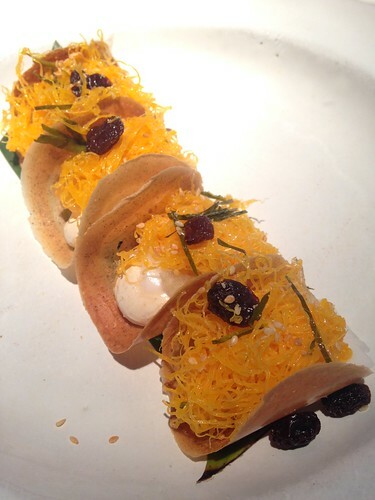 Lastly for dessert, we had sweet egg noodles, coconut cream and persimmons on a barquillos-type cracker. Not my favorite but it did plenty to soothe my inflamed taste buds. — We paid around THB2,800 for our meal. This included the bottled water (they do not have tap water) which guaranteed you will drink a lot of, because of the spicy food. — No you cannot ask them to turn down the heat and adjust the spiciness to your taste. I asked them and they said very nicely, “you will not be able to taste it as the chef wants so we do not recommend it” which is a nice way of saying… No. Should you try it? 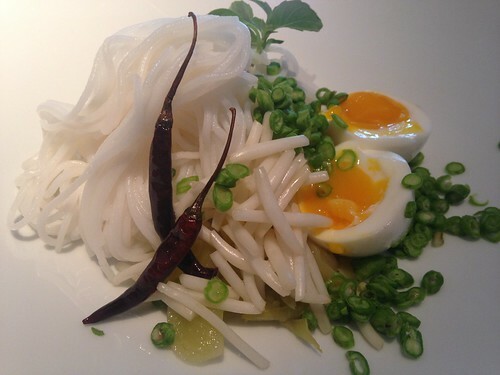 Yes, if you are a foodie and you want to try the fancier side of the Bangkok food scene. Honestly though, food in BKK is pretty good (regardless of where you eat) so to say that Nahm trumps them all is…a stretch. It’s delicious, no doubt. But I would certainly not call it the best. All in all, we had a great lunch. I would certainly like to come back for dinner as I hear their menu has more variety. 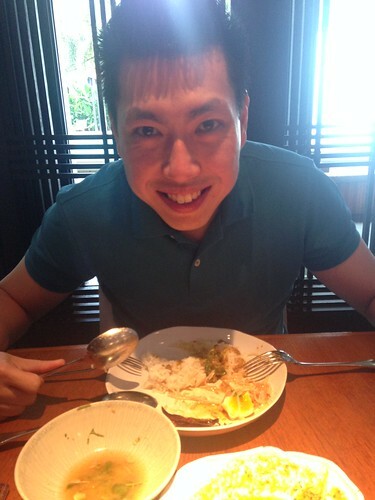 Derrick, who isn’t a foodie (and does not believe in fancy food) ended up enjoying Nahm more than I did. That’s a testament to how good it is.